Our best-selling bit is popular for a reason. It is the best in its class of one bit for multi-materials and construction uses as it will outperform and outlast others, especially when percussion drilling is required as it has a chrome vanadium steel shaft for maximum flexibility and strength. Its special negative back grinding enables the tip to bore with a filing action, not a cutting one, and the cobalt and tungsten carbide tip won't chip and crack like regular carbide tips. The unique tip geometry allows the bit to self-center, which eliminates walking and makes a center punch unnecessary. In addition, the flat bottom parabolic flute allows for faster waste removal. 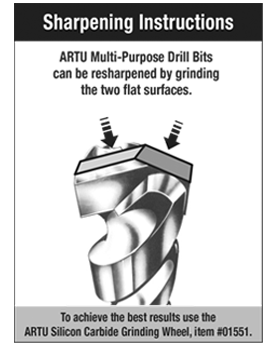 The ARTU Multi-Purpose Bit will drill holes in masonry, brick, concrete, granite, stone, marble, ceramic tile, baked ceramics, glass, crystal, mirrors, plexiglass, plastic, fiberglass, hard woods, soft woods, cast metal, and hardened steel (35 HRC to 70 HRC like a file or ball bearing) in the right drills at the right speed. * It will work in cordless drills, corded drills or drill presses, whether rotary or percussion; however, the use will depend on the maximum RPM of the drill and the intended material being drilled. See the instructions below and the notes that follow for clarification. *Please note that multi-purpose is not the same thing as all-purpose. No one bit can be used in all applications. If you need to drill a precise hole in your fine wood cabinetry and a hole through your stainless steel earring and a hole into your hard porcelain tile shower stall, you will need three different bits because those applications require different tips and flutes on the bits. 1 Be sure the tile is truly ceramic and not porcelain. If you are unsure, you should use ARTU's Porcelain Plus Bit, which can drill both ceramic and porcelain tiles. In general, if the tile is on the floor or is larger than 4"x 4", you should use the PORC+ Bit. 2 If liquid coolant is required, we recommend water, light oil, or turpentine. 3 Steel is by definition a very hard alloy; nonetheless, within the steel industry, some types of steel are harder than others. We recommend using the ARTU HSS or Cobalt Bits for mild steel and stainless steel. 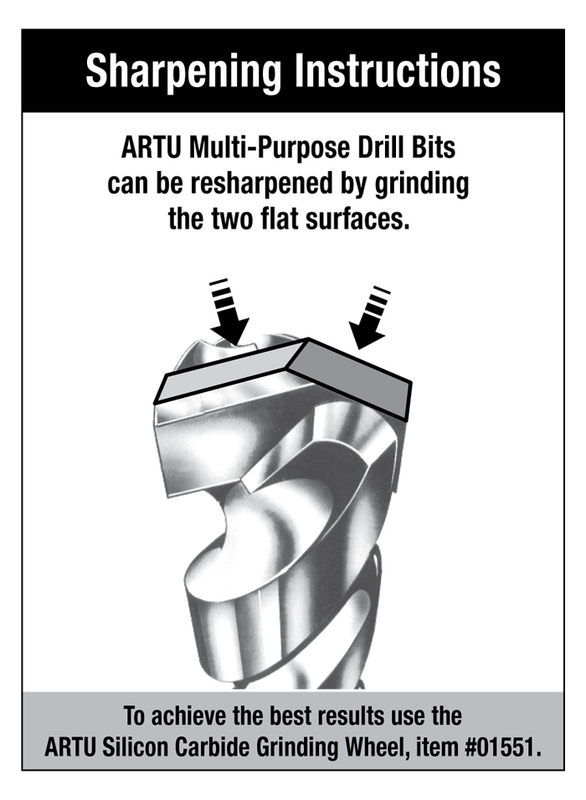 The ARTU Multi-Purpose Bit will drill very thin (less than 1/16 inch or 2mm thick) sheet metal (like stainless steel, aluminum, brass, and copper). However, the filing action of the bit will leave the back side of the sheet very rough, which is why we recommend our cobalt or HSS bits instead. The ARTU Multi-Purpose Bit can be sharpened by grinding the two flat surfaces of the tip with a grinding wheel attached to a hand drill at 800 RPM or faster. We recommend using the ARTU Silicon Carbide Grinding Wheel (Item #01551). The ARTU Multi-Purpose Bit has a shaft of chrome vanadium steel for maximum flexibility and strength to withstand percussion drilling. The shank has a hardness of 45-50 HRC. The tip is a proprietary blend of cobalt and tungsten carbide with a diamond ground negative angle. The high tech bonding allows the bit to withstand drilling temperatures up to 2000°F.